Public, independent primary school, Western Australia. From about the age of eight my daughter realised that she was more comfortable and free wearing shorts. But due to the school rules, she was being told that shorts were only an option if you had physical education, or were a boy. She would grumble and I sympathised. Initially, I felt torn between telling her that a rule is a rule (lots of things are unfair in life, get used to it honey) and rebelling and letting her wear shorts anyway (fearing I was teaching her to be disrespectful to authority, with floods of memories of my teenage antics). There was quiet discontent in the school community and our savvy girls seemed to be having sport days more often!! Nothing changed, the reminders kept coming in the school newsletter requesting that parents support the school and ensure that the sports uniform is worn only on the correct days. Fortunately, there didn’t seem to be any consequences for non-compliance. 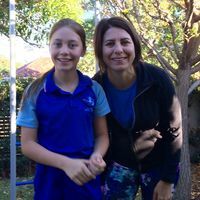 In May 2016 I read the story in The Age about Simone Cariss’s petition to the Victorian Government calling for legislation changes so that all schools would be required to allow girls a shorts and pants option as part of their everyday school uniform. This struck a chord for me with such a well-articulated argument and I decided it was time to tackle the issue locally. The petition was discussed on our local ABC radio station and overwhelmingly the public’s response was “are we really discussing this in 2017?” A member of the public called in to the show and named a few schools who still had this outdated dress only policy, including our school. I emailed our principal about the issue with a link to the petition and gently requested that the school consider updating the uniform to reflect modern standards, offering to assist with sourcing options. The principal promptly called me and advised me that the uniform policy would not be reviewed for another 2 years. It was only when I mentioned that our school had been named by ABC radio that the principal agreed to refer the matter to the School Board. A small group of parents wrote to the School Board about the issue and the response was to add tartan culottes (in the same fabric as school skirts or dresses) to the uniform to address the ‘modesty issues’. Whilst we felt the culottes offered another choice for girls, and welcomed that, it was not what girls REALLY wanted. In the meantime the Acting Commissioner for the WA Equal Opportunities Commission (EOC) released a media statement and was interviewed on this issue (see under WA legislation tab on this site). The Commissioner called on schools to provide uniform options for girls which allowed the same level of freedom and activity as boys. There was also a number of articles that appeared in the media on the issue and it was widely talked about in our school community (at P&C meetings, at the school gate, on social media, etc). We wrote back to our school board highlighting again the legal aspects of the argument and included a copy of the EOC statement. A number of other parents spoke to board members informally and also wrote letters/emails. Ten months after first raising it, the Chair of the School Board announced in the newsletter that girls would be allowed to wear sports shorts every day and that the policy would be reviewed formally. So much effort, so much fuss, so much time taken away from focusing on our kid’s education, when all that was required was for the rights of girls to be respected, and a simple uniform change to be implemented. At least we got there, finally!